For almost three centuries, the songs composed by troubadour Sayat-Nova have been among the favorites of the Armenian people. Despite being written in the dialect of Tiflis, with a mix of Turkish, Persian, and Arabic, their lyrics have always spoken to the heart of the listener. Sayat-Nova’s life is involved in a cloud of mystery. It has been reconstructed to a certain level by the work of several generations of scholars, but there are many details that are still a matter of controversy. It has been traditionally held that Sayat-Nova was born in Tiflis, the capital of the kingdom of Georgia, in 1712, and the 250th anniversary of his birth was celebrated throughout the Armenian world with great pomp in 1962. However, poet and scholar Paruyr Sevak was the first to demonstrate in his doctoral dissertation defended in 1966 and published in 1969 that there were more than enough grounds to date the poet’s birth in 1722. Most likely, Sayat-Nova’s ancestors were born in Cilicia, and the birthplace of his father was either Adana or Aleppo. The future poet and troubadour spent his childhood and youth in Tiflis, his birthplace, where he learned to write and read Armenian and Georgian, and he also knew the Arabic alphabet. At the age of 12 he became an apprentice of weaving and in a short time became a very capable weaver. However, his actual love was songs and music, perhaps influenced by his parents. Sayat-Nova perfected himself in the art of the ashugh (troubadours) until the age of 30. He learned melodies and different metrics. At the same time, he created poems, which he interpreted during popular gatherings. It is likely that he traveled through the Near East and visited Persia, India, and the Ottoman Empire. He later was acknowledged as a poet-singer and baptized with the name of Sayat-Nova (from Persian, meaning “hunter of songs”). Sayat Nova wrote in three languages: Armenian, Georgian, and (Azerbaijani) Turkish. More than 230 of his poems have reached us, which were collected in manuscript books that he wrote by his own hand or that his son Ohan compiled and copied, in various collections of folklore, or remained in the memory of the people and were gradually written down and published. The earliest poem is dated 1742, even though there may be earlier compositions. The last poem was the famous “The World is a Window…” («Աշխարըս մե փանջարա է…»), written in April 1759. Sayat-Nova was the first who created and sang Georgian poems using the motifs of Persian poetry. This innovation was well received and he was appointed musician in the court of King Irakli II of Kakheti (one of the Georgian kingdoms). For some ten years the poet was in the court and produced some of his best works in this period. His poems spoke of justice and nobility, condemned deceit and villainy, and social and moral flaws. His love poetry expressed the most delicate and sacred feelings with images that were unusual. 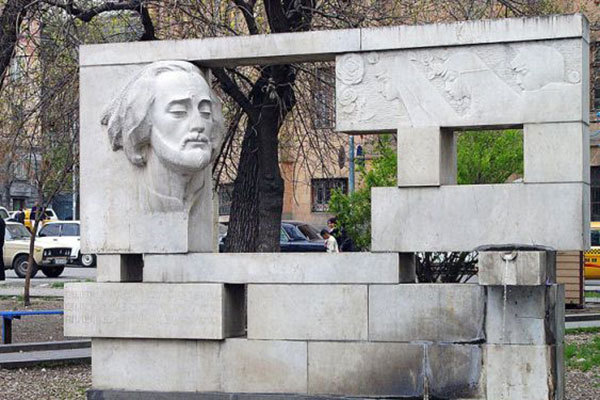 The monument to Sayat Nova in central Yerevan. His life was not peaceful. There were conspiracies against him and he was expelled from the palace at least twice, in 1753 and 1759. The last one was the final, and his life as poet, composer, and musician ended there, at the age of 37. He would still live for more than three decades. In 1759 Irakli II forced him to become a priest, with the name of Der Stepanos, and he was sent to the port of Enzeli (Persia), on the southern shore of the Caspian Sea. He “repented” here and copied the poem Book of Lamentations, by Gregory of Narek, in 1760. In 1766 he was a priest in the small town of Kakhi, on the road from Zakatala to Shamakhi, where he copied another manuscript, a compilation of biblical fragments. Both manuscripts are kept today in the Matenadaran of Yerevan. Sayat-Nova’s wife, Marmar, passed away in 1768 and left four small children (Hovhannes or Ohan, Melkiset, Sarah, and Mariam). In 1768 or 1769 Der Stepanos, the former Sayat-Nova, moved to Tiflis, where he served in the prelacy of the congregation of Haghbat, which had settled in the Georgian city. In 1778, when the monastery of Haghbat was rebuilt, he was designated sacristan of the church of Surp Nshan. He returned to Tiflis with the congregation later, probably in 1784. On September 22, 1795, during the Afghan invasion of Georgia, led by Agha-Mahmad Kajar, Sayat-Nova was killed when he refused to renege his religion. He was buried in the courtyard of the church of Surp Kevork. There, by initiative of poet Hovhannes Tumanian, the memory of Sayat-Nova has been observed since 1914 every May with popular festivities.